Hey all new to the forum just signed up last night. Then spent most of the next hour or two searching to see if someone already asked about this particular specie. I didn't find it so here I am to ask for your help. I have about 5 groups of this in my back yard and one in front, I say groups as there are multiples from one area. Just moved into this home in June, and if I am recalling correctly they had white flowers this spring. Then had small bunches of green berries, which are now turning red. Also there are thorns or twigs that actually grow to a point. I tried to get a picture of one it may not have turned out so well. And there doesnt seem to be an abundance of the thorns. They are around 12ft or so high. Look up Elaeagnus Umbellata and see what you think. 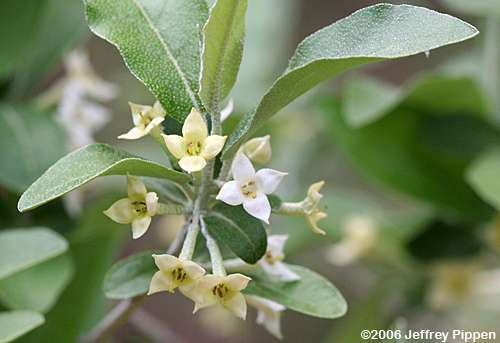 I have Elaeagnus multiflora and they are quite tasty. Sweet Scarlet is the variety name. Because it fixes atmospheric nitrogen in its roots, it often grows vigorously and competitively in infertile soils. ... In some parts of North America where it has become naturalized,Elaeagnus umbellata is considered an invasive species. It is considered a "prohibited noxious weed" under the Alberta Weed Control Act 2010. Elaeagnus umbellata fruit is more like Enamelware, not smooth and glass like. I said you were right!! Well they aren't really spreading so to speak. I haven't seen any growing any where but where they are now. And if I read correctly upon searching Elaeagnus Umbellata they are edible? A confirmation would be awesome. Not that I am doubting the answer received here, as to what it is. Any idea how to get a second confirmation as to what it is? Would I contact someone locally? You may not have noticed it spreading yet since you have only lived there a couple months, but the fact that you have "five groups of this in my back yard and one in front" tells me that it is in fact quite weedy and aggressive. Or the previous owner was into growing food, edible landscaping or far reach a permaculturist. I highly doubt the last one. As for taking over "weedy" I have not seen this. I only have Elaeagnus multiflora, but a friend has a dozen Elaeagnus Umbellata. They are in a hedge row along with filberts "Corylus maxima". Well I lied I have 7 groups in the back. AND yes they are delicious, the wife and kids weren't thrilled by the raw berry but I have found a recipe for jam. The flavor almost reminds me of a wild grape, sorta tart but finishes fruity. Kinda kicking myself in the behind now as I already trimmed off quite a few branches so I could get around them with the mower. But they are still laden with berries.